← 309 "Dude, Where's My Ranch?" The Simpsons are 1930's construction workers, sitting on a high-up girder watching TV. "My pen is not a boogie launcher"
"Old Yeller-Belly" is the nineteenth episode of season 14. "Homer throws out Santa's Little Helper for not saving him from a fire, but soon the dog becomes Duff's new mascot." Bart and his friends are having a secret club meeting in the treehouse, when they realise Lisa and her friends are also having a meeting. The boys then decide to listen in to the girl's conversation and they hide a cup phone in her room. However when Bart jokingly imitates Marge's voice through the phone, the girls discover the phone and begin to tug on it. The boys also tug on it and the treehouse is demolished. Homer and Bart decide to build another treehouse but their plan fails when they mess around. Marge calls the Amish and they re-build the treehouse brilliantly. Bart then holds a party to celebrate his new treehouse; but disaster strikes when the it bursts into flame. As the guests flee from the treehouse, a ice sculpture collapses on Homer. Santa's Little Helper is also in the house and Homer attempts to persuade the dog to rescue him; however the dog flees from the house, taking a roasted chicken with it. Snowball II climbs up the tree and saves Homer, leaving Santa's Little Helper in disgrace. Homer declares the cat a hero and throws Santa's Little Helper out of the house. The dog is discovered by a photographer, who takes pictures of him and Santa's Little Helper is made the new Duff mascot. Meanwhile, Homer is interviewed and he claims he has no dog. Santa's Little Helper's name is changed to Suds McDuff and is instantly a hit with the public. 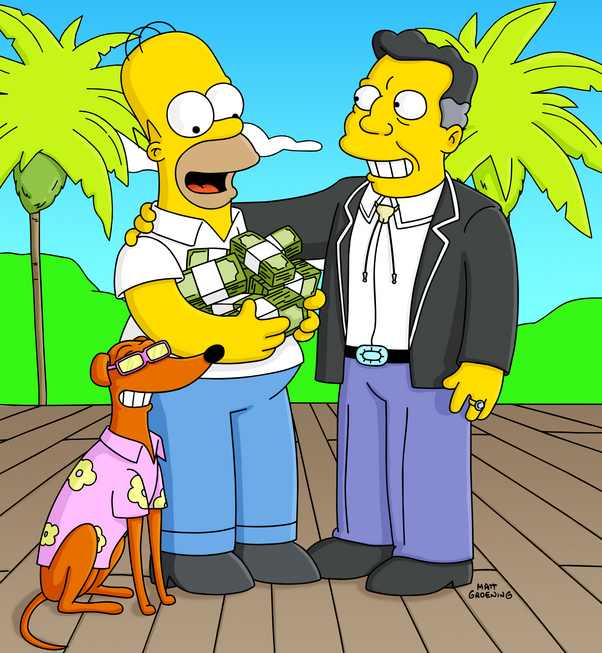 The Simpson's visit the Duff Boss and are about to be paid when Santa's Little Helper's original owner appears and he reclaims the dog. The Simpson's want to get the dog back so they make a plan. They visit Duffman and convince him to help them. He accepts and leaves the Drunk Help Building he is teaching at. During a Duff Beer publicity event at the beach, Homer pretends to be drowning. (He is really floating on a keg of Duff Beer). Santa's Little Helper is to scared to help Homer; which surprises the public. Duffman tries to help Homer but is also to cowardice and he stays on the beach. Meanwhile out at sea, Homer is attacked by a giant shark; who bites into the beer keg and gets drunk. The drunk shark floats onto the beach and is declared the new Duff Beer mascot. Santa's Little Helper's new owner now doesn't want him any more and the Simpson's take him home. Modified on July 15, 2017, at 07:15.